Stephen Curry capped a game-high, 32-point performance with a key three-point play with 1:46 remaining Tuesday night, helping the host Golden State Warriors hold off the Russell Westbrook-less Oklahoma City Thunder 108-100 in the second half of the NBA's opening-night doubleheader. Kevin Durant dropped in 27 points for the Warriors, who overcame 7-for-26 shooting from 3-point range to win on opening night for the first time in three seasons. Paul George had a team-high 27 points and Dennis Schroder made his Oklahoma City debut with 21 points. They helped the Thunder hang tough with the two-time defending champions while Westbrook watched from courtside, still rehabbing a surgically repaired knee. Curry's three-point play came after the Thunder, down by 14 in the first half, had closed within 99-97 when Steven Adams converted the second of two free throws with 1:57 to go. Durant added a hoop, two free throws and an assist in the final 1:06, helping Golden State hold on. George scored 13 points in the first 3:56 of the third period, leading a 21-10 Thunder flurry that produced Oklahoma City's first lead of the game at 67-66. 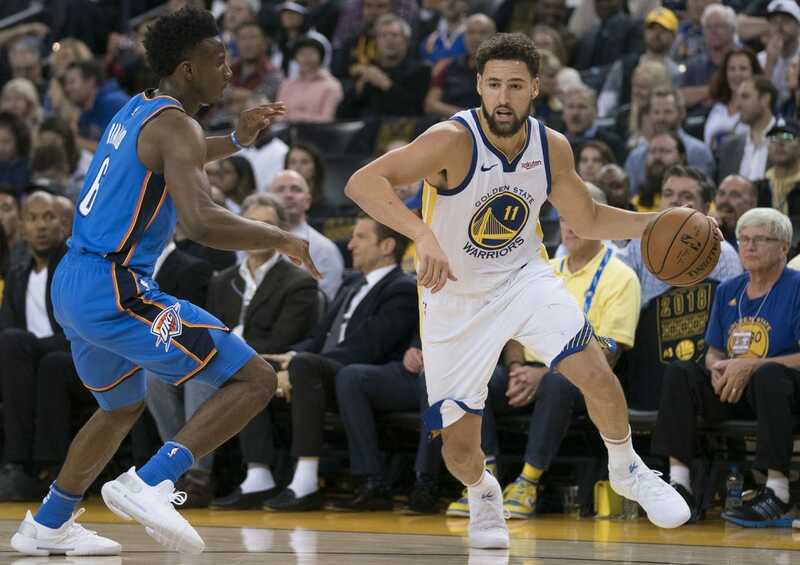 Two free throws by Thunder forward Jerami Grant tied the game at 87-all with 9:21 to go before two free throws by Durant nine seconds later gave Golden State the lead for good. Adams had a double-double for the Thunder with 17 points and 11 rebounds. The Warriors led for the first 28 minutes, with Curry propelling them to an early 31-19 advantage by making his first two 3-point attempts. A free throw by Durant with 3:04 left in the half gave Golden State a 53-39 lead, which the Thunder trimmed to 57-47 by halftime.